What Makes Allwebco Web Templates Better? Unlike most of our competitors' website templates, Allwebco webpage templates are complete downloadable stand alone websites. Each design is setup with multiple pre-formatted web pages, rather than only the one or two pages offered by other template vendors. Contact forms, search forms, dynamic slideshows and photo galleries, shopping carts and jQuery or CSS3 animation, plus many other features are built-in. This saves considerable time during web development. The menu, footer, sidebar and css style files are all global for quick site updates. Menus are plain text. No graphics editing is required. Built in HTML, all stock photos are included and are standard .jpg files that can be edited or replaced. Our websites work with any hosting company and can be edited using any plain text or wysiwyg or html editor. Website templates downloaded in .zip file format, like Allwebco offers, are complete stand alone or "self contained" websites. This allows the user to freely modify the design to their own personal specifications. With a web builder or content management system your website will be locked into the vendor website making it difficult to move to another hosting company. All designs are ad-free, include no monthly fees and are not linked to, or dependent on, our web site to work on your website. Once downloaded all source code, stock images and files are included exactly as displayed in our on-line samples, read comparison. Alternately, web site builder programs offered by companies like Squarespace, Wix, Weebly, web.com, Godaddy and others will include monthly fees and a proprietary editing interface to edit their website templates directly on-line though a web browser using their library. Although this may sound convenient, something to keep in mind is that you will most likely spend many hundreds of hours creating and updating your website and you will not have a copy of it anywhere except inside the web builder's program cloud. Because it's proprietary, you will be locked into using a single company provider. If you become dissatisfied with their service you will need to redo your website from scratch with another company. Are the web templates mobile compatible? We offer a selection of responsive designs and also websites that include an integrated mobile sub-site. See mobile sub-sites for details. All Allwebco web templates are setup for, and tested on, the most popular mobile devices. Designs are specifically configured to display properly on the widest range of PCs, Macs, laptops, tablet computers, smartphones and other mobile web viewing devices. Check out our mobi-Hybrid® webpage templates for the highest mobile device compatibility. For more details see also optimization for mobile and choosing responsive or a mobile sub-site. Are your templates SEO configured? Yes. Our web templates all include standard meta tag data as well as image "alt" tags already setup and ready for editing. Title tags, the most important website SEO element are plain text and setup for custom editing. Any other SEO types of codes can also be added like Google Tools code and site map XML files. See our SEO support page. Can you use CoffeeCup for editing? Yes, our website designs are compatible with the CoffeeCup HTML editor. A free trial download of this software is available. See HTML Editing Software in support for more editing software choices. Are they compatible with MS Expression Web? Allwebco web templates can be edited with Expression Web. You can import a template into the editor and publish as an Expression Web. While editing, in the "Design" view, you will not see the header or footer because they are global .js files. However, all of the files, can be edited in Expression Web. Are they editable in Dreamweaver? Yes the web templates are editable in Dreamweaver. You will not see your header and footer when you're editing because the header and footer are global ".js files" that you edit separately in a plain text editor, so you can change all your pages at once. You will see the main body of text and the pictures while editing. View more details on Dreamweaver editing. Are they editable in Contribute? Yes the web templates are editable in Adobe Contribute. You will not see your header and footer when you're editing because the header and footer are global ".js files" that you edit separately using a plain text editor. You will see the main body of text and images while editing. View the web template getting started support page. Are they compatible with Frontpage? Although this is older software it still can be used for editing even our newest html5 & css3 responsive designs. You can not change the layout but can edit all text. You will not see your header or footer in Frontpage because these are global files you edit using a plain text editor. Allwebco web templates were not originally created in Frontpage and are not set up as Frontpage "Webs". View a screenshot while editing in Frontpage. Do I need any special software to set up my web site? Although you can use any wysiwyg editor, Allwebco web templates are so basic that you can customize your entire site using Notepad, Textedit on Mac, or any plain text editor. The only additional software you may need to setup an Allwebco web template is FTP software to upload your pages (Windows Explorer includes FTP capabilities). More info on editors including Free editors. See also FTP uploading details. Can I replace the template images with my own images? All images used in an Allwebco web template are standard .jpg and .gif pictures. These pictures can be replaced with your own pictures by overwriting the files in the "picts" folder after your download. All the code and graphics used to create the web template are sent along with the download. Click for more image editing details. Do I need Adobe software to edit the animation or replace images? jQuery animation uses standard linked .jpg images. For Flash animation, Adobe software is not required to update any area on the web templates. With Allwebco web templates, the logo and all text displayed in the Flash animation is controlled by one file named "flash.txt". This file can be easily edited with any text editor to add your company name, slogan and phrases. Any animation included with a template will include "linked" standard .jpg images that you can easily replace with your own standard .jpg images. Can I use my own logo in the header? 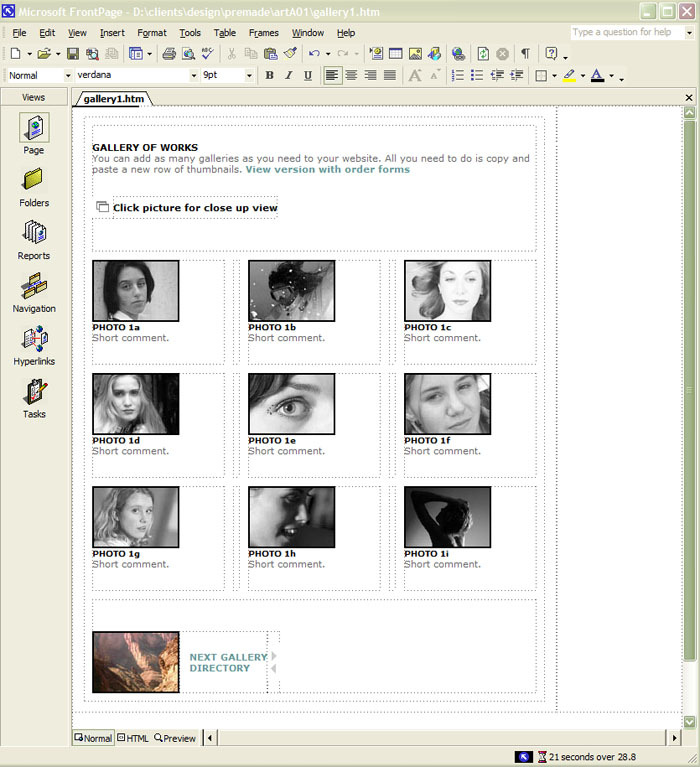 All Allwebco web templates feature a graphic logo option. Depending on the model you choose this will either be a yes/no variable you edit to switch from the plain text logo option, or you will need to rename one file and then replace the pre-defined graphic logo image. Instructions are included for all options. What about browsers that do not support Flash? All Allwebco web templates are HTML websites and most include jQuery animation rather than Flash applications. Every web template includes a graphic logo option so no Flash is required if you choose to setup a non-Flash website. Additionally, designs with Flash include detection to display alternate content in non-Flash supporting web browsers. View the Flash detection for mobile details page. What are "global" editing features? I am a novice user, are step-by-step instuctions included? We do have many novice users that setup our web templates, however, when setting up an Allwebco web template you will need to learn some HTML editing. Every template includes step-by-step instructions and we also offer a searchable template support center. Can I add new webpages? Our web templates are flexible enough that you can add as many pages as you want by making copies of any existing template page. Links to new pages can be added to the web template menus or on any of the web template pages including the site map page. Click for support for adding and removing pages and also see editing the menus. I have very little knowledge of the tools (e.g. Notepad) required to edit your website templates. What kind of struggle am I going to have, time wise, modifying with my copy? Most people have indicated that our web templates are very easy to use. For a professional, it's usually between 4 and 6 hours. This includes creating some custom graphics. I've see one user setup their entire site in less than 2 hours and I've seen others take weeks. The more computer skills you have the easier it is to setup an Allwebco web template. If you know exactly what you want to add and will use the web template pretty much "as is" then usually the only obstacle is setting up the contact form and uploading. There are instructions on the help page and info in our template support area to guide you in these areas. I recommend you to everyone. You have the best website templates, but more importantly, you have the best service out there! First, thank you for all of your help. My website is now up and running and I am very happy. You and Allwebco Hosting and Design have been incredibly responsive. Thank you very much for the web template. As you can see, it complements my business to a tee. People see the site and can't believe how beautiful your product is, especially for the price! I think you have created a wonderful template - very easy to work with, beautifully laid out, good instructions. I am very impressed. I have accomplished a lot in just one hour!! The site was very easy to customize, as per your included instructions, and I had it up and running within 3 hours of receipt. I will not hesitate to notify my fellow photographers and others of your quality website templates, and professionalism. I am sure your Support is just as good! I will never "shop around" for the ideal template again. Again, Thanks for everything. Beautiful web templates. I am back to purchase another. I would like to thank you for all your help related to getting my site up and running I really appreciate it. Your timely responses saved me a lot of time, so thanks a lot. Sorry, I forgot to let you all know we got the site up! SOOO pleased with the web template. Very well done and easy to use. Allwebco web site templates are basic HTML design. Flash applications, with detection to display alternate content in non-Flash browsers, is included. Optionally all Flash can be removed. All web templates include a graphic logo option to create your website project as a Flash-free website.The included menu files are plain text global files that can easily be edited using any plain text editor to add or remove links/buttons. Web templates include a built-in contact form as well as other features like image gallery pages, PDF downloads, testimonials pages, about, services and Paypal custom payment pages as well as the Paypal shopping cart may be included. Website template downloads will include all of the source code used to create the website, step by step help, unlimited access to the searchable support website and quick, comprehensive e-mail support. Any web template can be setup using any hosting service. Compatible in all popular, and even less-popular, web browsers. MS Explorer, Google Chrome, Firefox, Apple Safari, Opera, etc. For both Mac or PC, laptops, tablets, smartphones and other Internet devices. See the F.A.Q. for more. Why Choose Allwebco Website Templates? Allwebco web templates are not built like any other web templates. All sites are complete websites with multiple built-in pages and features. All menus are plain text and no graphic editing or special software is required to setup any web template. Any Allwebco web template can be setup and placed on-line using only Notepad and your hosting control panel for FTP uploading. CSS files are included for all font styles, sizes, form elements and basic layouts and designs. View the color editing support page. Allwebco website templates are not Flash built websites but do include Flash animation with detection for non-Flash web browsers. Flash only websites may list poorly in search engines, so all templates are coded using basic HTML. All web templates are returnable within thirty days for a full price refund. Purchased website templates can be upgraded within 90 days with full credit on the original purchase. Updates are free indefinitely. When any web template is updated you can request a new download free of charge. Allwebco does also offer a selection of free template add-ons and hundreds of pages of help in the searchable web template support website. Notes to edit in all pages. Order with or without hosting. Flash animation edits in Notepad. Edit all colors, fonts, sizes, etc. Edit pages in EW, FP, DW, Notepad, more. Access to our Support Center is included. Easy inexpensive way to create websites. Work is totally done by you, saving money. High-end designs you can not get anywhere else. Allwebco website templates are only offered on the Allwebco Design site. Website designs not available anywhere else.